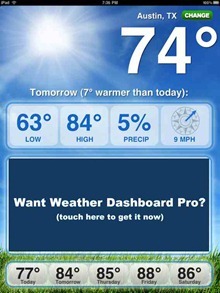 Weather Dashboard Free for iPad is touted as ‘the weather app that should have come on the iPad‘. It’s not. It’s the free weather app for iPad that absolutely feels like a free app, except that it’s a fair bit worse than most free apps. The screencap above shows the full extent of what you get with the app. A slim amount of information on current weather conditions, along with temperature outlook (no forecast) for the next five days. That’s it – there’s nowhere to tap for anything further or more details. You’re supposed to be able to tap to add more than one location, but the app crashes back to the home screen every time I attempt to do so. The thing that makes this app worse than most free apps for me is the huge amount of space it takes up with an ad prompting you to buy its ‘Pro’ version. The ad takes up a crazy proportion of the entire screen, and is there all the time. The crazy thing about the huge ad, is that despite dedicating all that space to it, it offers zero indication as to what you get if you upgrade to Pro. Seriously great use of the space for self-promotion – no clue as to what benefit the user may get for upgrading, what a big incentive to make the switch eh? The app is not well done or handsome to look at – and is made just plain ugly by the huge ad. With gorgeous apps like Weather HD around for just $0.99 and several other good free options, this one is an almost immediate deletion for me. 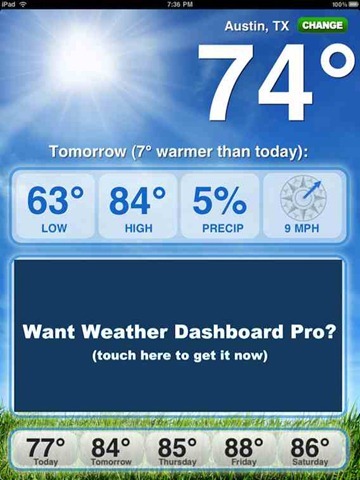 You can find Weather Dashboard Free in the App Store now, and it is a free app.